Luster’s Pink is known for bringing moisture-rich products to millions of naturally curly women for decades, and it’s no wonder: the formula is versatile enough for healthy hair maintenance and styling. From relaxed and color treated tresses to transitioning naturals and lifelong curlies, Luster’s Pink product lines enhance the inherent beauty of all hair types thanks to the moisturizing properties of coconut oil. Another moisturizer used in Luster’s formula is shea butter, a natural hair community favorite! Luster’s Pink is formulated with all hair patterns and textures in mind. 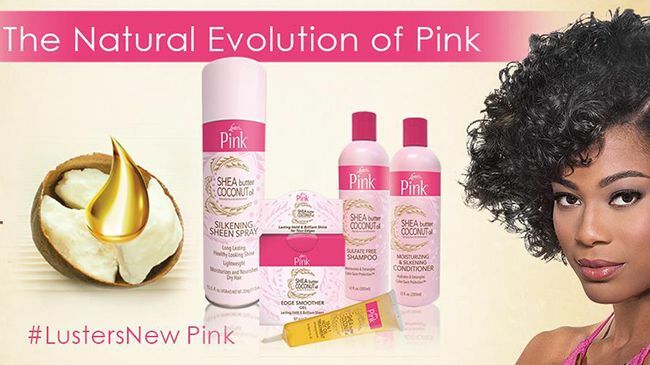 That’s why we’re so excited to offer our Naturally Curly community members a chance to the Luster’s Pink Prize Bundle! 5 lucky winners will be selected to add the Luster’s Pink collection to their Holy Grail stash. So, don’t delay - enter now for a chance to win a Luster’s Pink Prize Bundle! And one lucky winner will get a $100 Visa Gift Card!!! Can't wait to win them? You can buy them now at your local beauty supply shops, drug stores, Target and Wal-Mart. This post is sponsored by Luster's Pink .